Thanks for reading, Charlotte, and for the pingback! 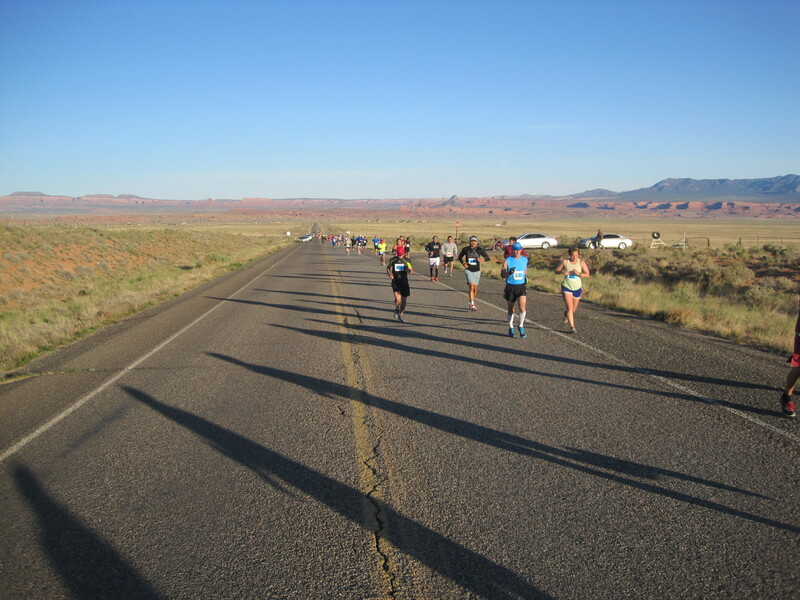 I remember training for my first marathon with nothing but fondness, and since you only get that experience once, I love reading about others going through the same process, relishing the new milestones and challenging themselves on a weekly basis. Best of luck with the summer long runs! 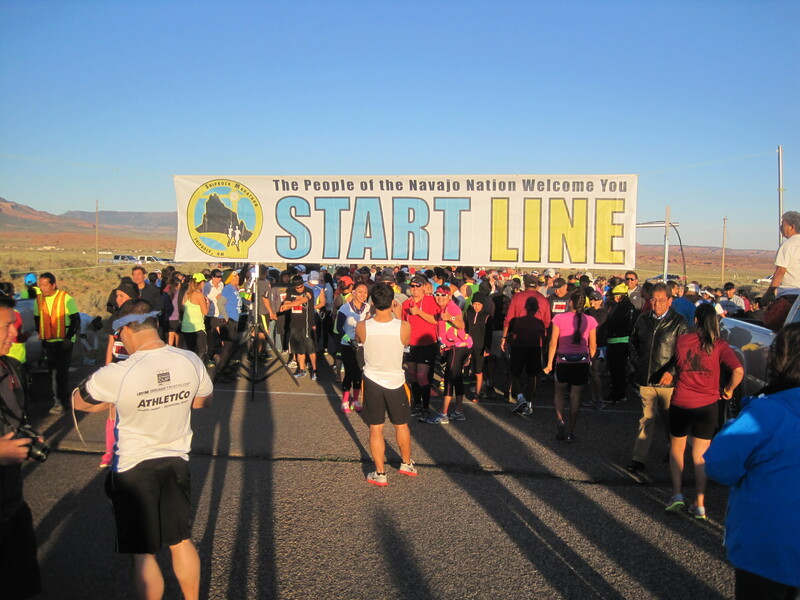 I didn’t need to read a word – the photo of the start line drew me in and instantly I wanted to run this marathon. Excellent! … but I hope you still read a little bit? Sure did. Congrats on your finish time. I’m always nervous when people visit New Mexico for fear that they’ll take one look around and wonder why on earth they spent hard earned money to visit this dry, hot place with no rivers and no trees. I’m thrilled that you enjoyed the race except for the parking issue (I want to apologize, even though it isn’t my fault?) and even had moments where you thought you might PR. PLUS, I’m very happy that you took away some of the cultural significance of Shiprock and the flag song. 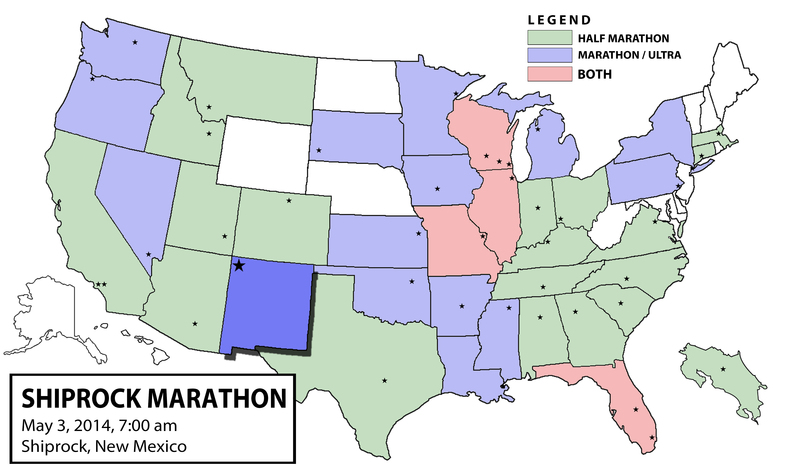 The incorporation of Native American tradition really sets this race (and the state) apart, and I’m glad that you could experience some of that uniqueness in your 50 state quest. And a huge congratulations to Ryan (great picture of him sneezing or something by the way!). We had a great time hanging out with you all! I should just carry a classic Spanish guitar and a rose with me everywhere. That way, when I pronounce your lovely state New Méjico, I won’t come off as a complete tool. Thanks for taking the time to show us a little bit of ABQ. 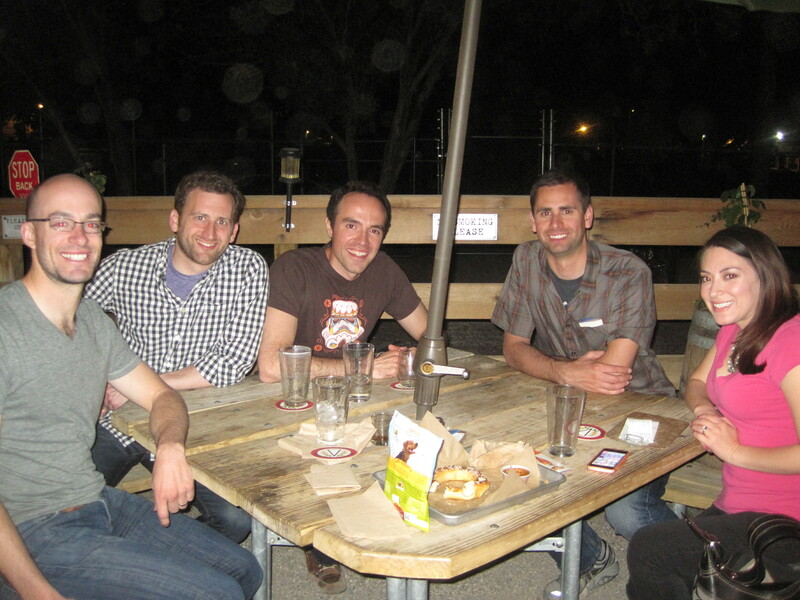 It’s always fun for me to visit new cities and partake in a tiny sliver of the local flair, and I’m glad our schedules matched up to allow for a meet-up. I wish I could have stayed longer, but that just means I’ll have to make another trek out in the future, hopefully with enough time to hit up Rebel. Also, Dan, nice job on the marathon, the post, and for driving. Yeah. 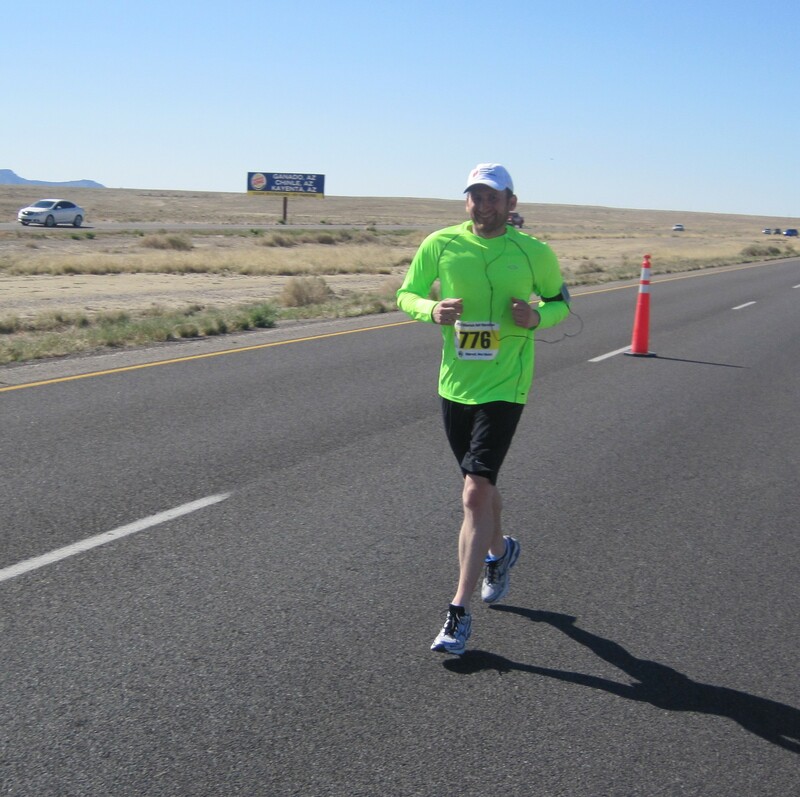 Congrats on another marathon finish and on what sounded like a fantastic running experience up to mile 22-ish. So jealous you got to meet the Lavenders – I’m hoping to meet them in Santa Rosa in August, and it’d be great to meet you too at some point! Thanks Jen, and congratulations to you on your Big Sur finish! I’ve had the San Francisco Marathon on my radar for a long time, and I just might go for it next summer (no promises though), in which case, I’ll definitely holler at you for some fun times in the Bay Area. Though with all the moving you’ve done, I’m not entirely sure where you are these days. Regardless, I’m confident that we’ll make a meet-up happen. Oh, I’m still around the Bay Area so definitely hit me up if you end up running SFM! I might actually run that in 2015 as well, since they have a “52.4 club” for people who have run both half marathons and the full in consecutive years. I’m not usually into gimmicks like that, but when I found out there was a free hoodie… I must say, I’m a sucker for free loungewear. Nice work, Dan! Again, totally jealous reading your recap, even when you get to the grunt and breathe section. I know the pain associated with it, but I also know the pure joy that comes from fighting through it. Nice job. 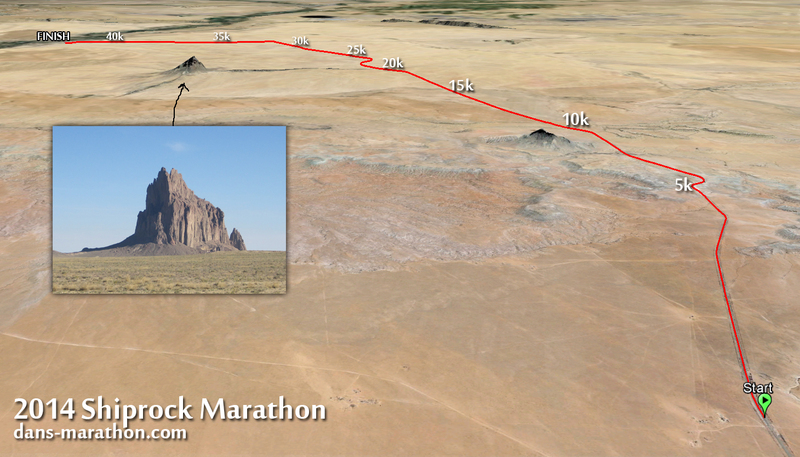 Also, that “shiprock” looks a lot like something out of Game of Thrones. Dude, now that you mention it, Shiprock kind of looks like the Iron Throne itself, with its jagged peaks that look sharp enough to cut. That only adds to the intimidation. 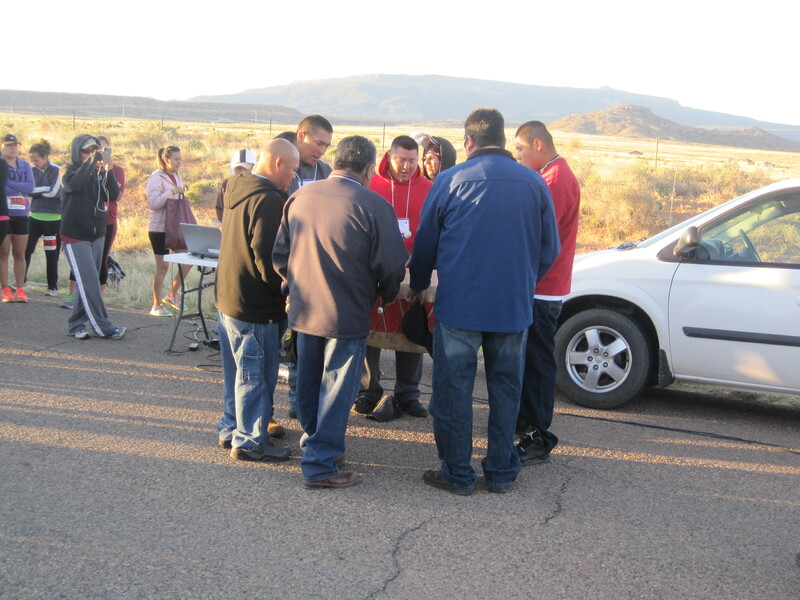 As I wrote the recap, I wanted to apologize to the Navajo for characterizing that sacred mountain as something evil … but seriously, it’s just so imposing. 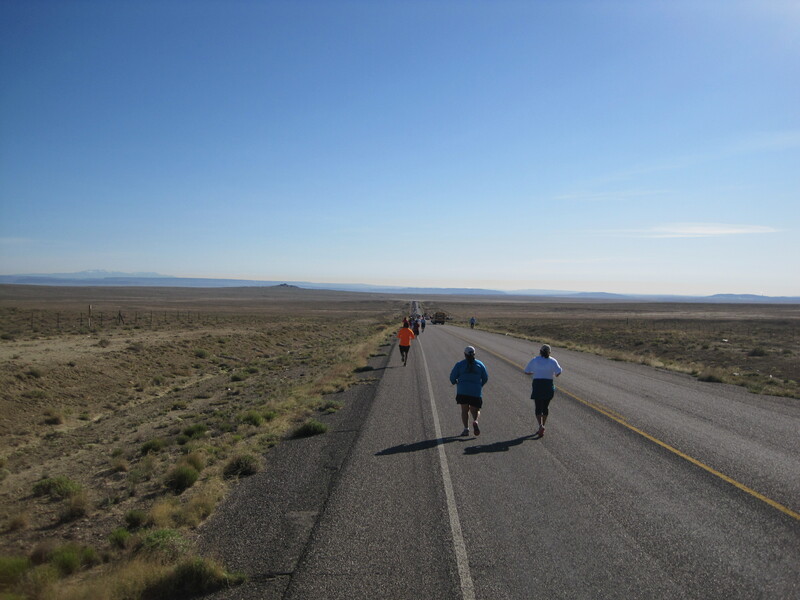 Now I’d like to read the 2014 Shiprock race recap from your quads’ perspective… how did they feel the day after bombing the downhills on limited oxygen? 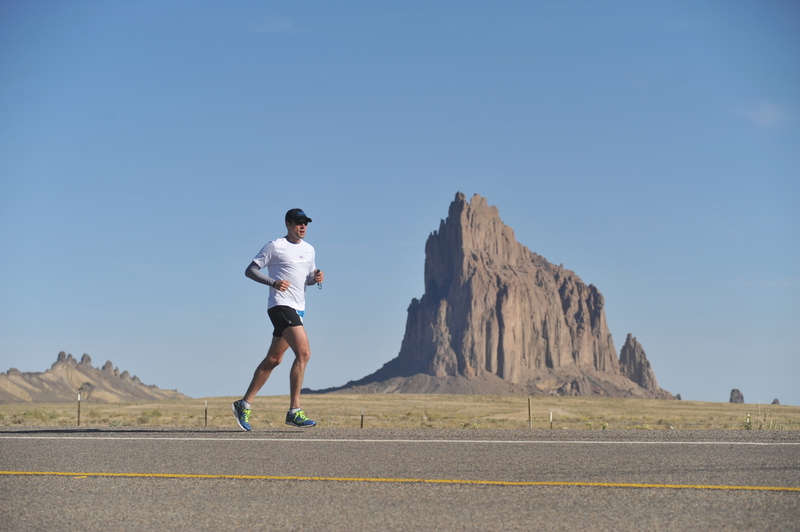 As much as I loved running Chicago, and as much as I look forward to the other big-city races I’ll run in the future, there’s something very special about a race like Shiprock, where you can stretch the legs in wide-open spaces while feeling like you have the entire state (almost) to yourself. It’s a major reason why, given a choice between road and trail running, I’ll always gravitate toward the trails. 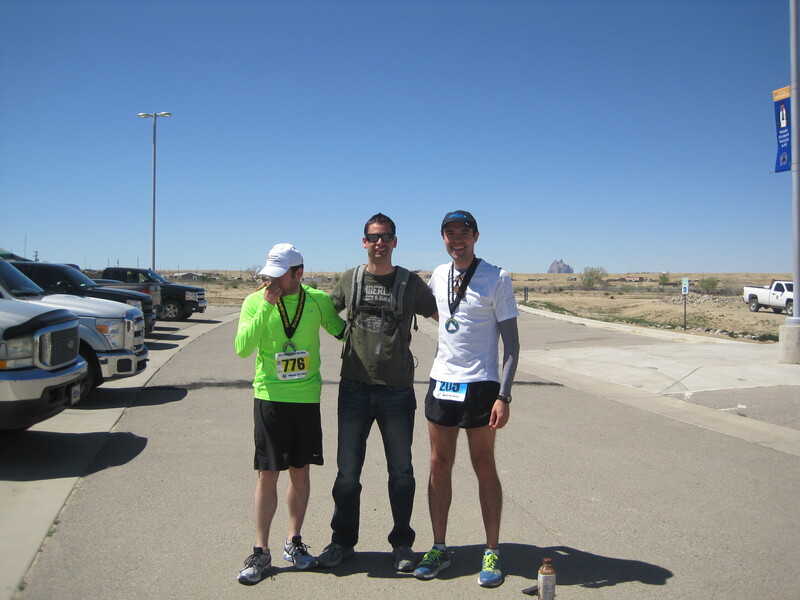 Great job on another strong marathon outing despite a nasty blister, 19% less oxygen and the unfiltered Southwest sun beating down on you. Nothing will ruin a perfectly good run quite like blister onset, and trying to guess (on the fly) exactly how large a blister is based on the pain. Nefarious little nuisances, they are. On the bright side, they do heal quickly so yours should be but a blogging memory by the time you reach Maryland. Thanks for a lovingly detailed account of the consummate New Mexico experience… assuming the parking situation improves, I’ll definitely give Shiprock strong consideration when I point my “50 States” RV toward the Southwest. Believe it or not, I was more of a stiff mess after St. Louis than this race. I ran very similar times, but this time it was the bottoms of my feet that were carping louder than every other muscle group, with that nasty blister holding a megaphone. It’s healed up considerably in just these last three days, so I’m no longer that worried about the weekend. You would have loved this race, Mike. If I’ve learned anything from reading your race stories, it’s your insatiable desire to connect with the outdoors. Rain, heat, mountains or plains, you just love running through the earth and, dare I say it, possibly reaching some sort of spiritual euphoria from it. 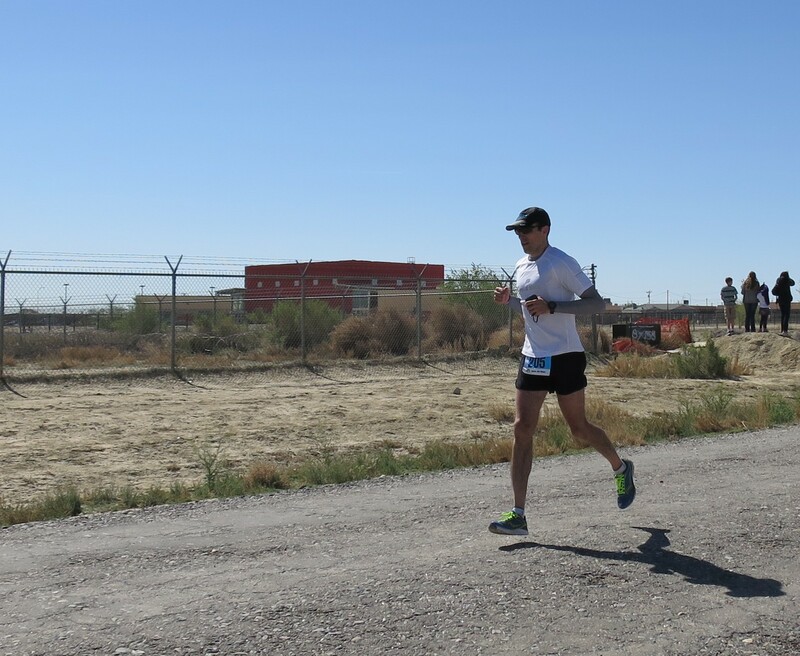 So to run through this mystical desert with such an enormous, omnipresent sentinel would have definitely made you smile (even though it’s not a trail race). Man, the bus ride out to the start brings back memories of Loch Ness, but instead of 30 minutes, it takes about an hour to navigate the winding back roads along the loch. It’s pretty humbling to see just how far you have to run back! I’m also jealous you got to meet the Lavenders (and Giuseppe!!). You guys all need to plan a European tour. Seriously. Well done on another comfortable (mostly) fast marathon. And good luck this weekend! Hope the weather is kind. The glass half full says “humbling” and the empty contingent goes with “defeating” — sure, part of you thinks it’s awesome that you’re capable of running back … but then you realize just how much easier life became when our ancestors invented the wheel. Good luck with the ballot – I missed out! I was too busy at work and when I got my first chance, the ballot was closed. I think Vienna might be calling my name instead…. 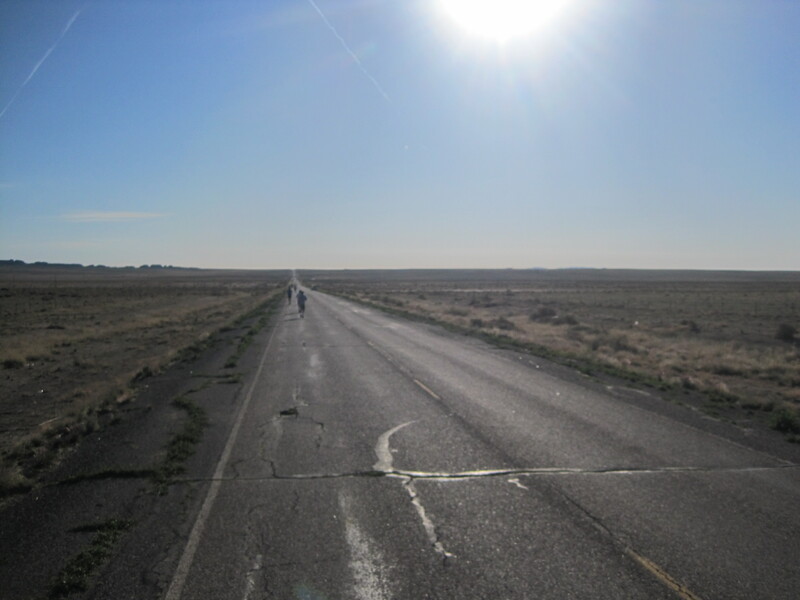 I don’t know if I could do that one…just being out in the open for that many miles sounds daunting to me. Also, random question, are you part of the Marathon Maniacs group?? I’m sure you’ve qualified for many of the levels about 10 times.